Whew - Christmas is behind us and we can move forward into the next year filled with great hope and possibilities. I hope you holiday was wonderful and you have sweet memories. 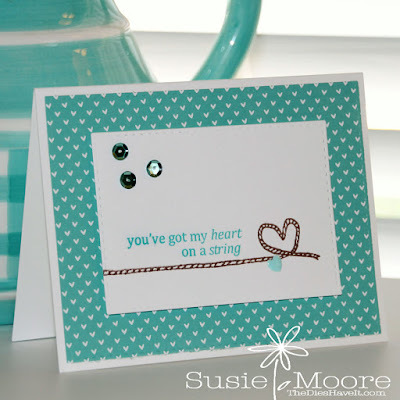 My card today uses the new Gina K. Designs Twine Time stamp set illustrated by the oh so talented Melanie Muenchinger. This set has so many elements that are twine related....but today I went "simple". The twine and the heart are two separate stamps and they match up perfectly. Next I plan to use the twine in a more wavy pattern. I'll share that card soon.